Was delighted to see the visitors come back from 2-0 down. 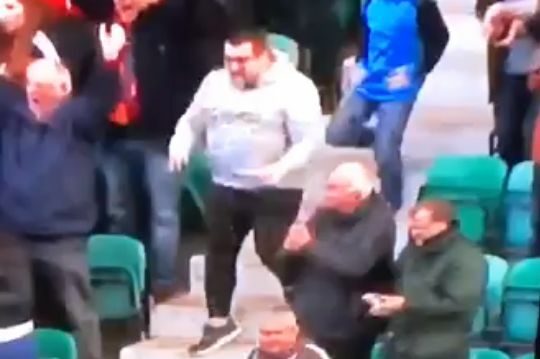 See a Motherwell supporter slip down the stairs in the stands at Hibernian while celebrating the visitors’ second goal in a 2-2 draw at Easter Road on Saturday. The travelling fans were understandably delighted after seeing their side come back from 2-0 in the Scottish Premiership clash with two goals midway through the second half. Rushing towards towards the players in front him following Louis Moult’s 74th minute equaliser, one Motherwell fan got over excited and failed to watch his step, slipping on the stairs as he ran down them.